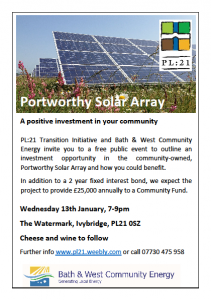 In a radical move to bring more community-owned energy to the SW Devon area, Ivybridge group PL:21 Transition Initiative, has teamed up with award winning Bath and West Community Energy (BWCE) to give local people the chance to invest in a newly built solar array. BWCE offered investment in a 2 year fixed interest bond to complete the purchase of a 4.3 Mega Watt (MW) solar farm at Lee Moor. Tamar Energy Community (TEC) and Transition Tavistock supported PL21, a fellow partner in the S.W Devon Community Energy Partnership, to publicise this investment offer. The bond offer and how local people can get involved was explained fully at a free public meeting on the 13th January in the Watermark, Ivybridge, PL21 0SZ, at 7pm. The solar array has been constructed on brownfield land associated with the old china clay works at Portworthy Dams, near Lee Moor and will generate enough clean energy to power about 1300 average homes every year. As a community enterprise it will generate over £20,000 per year to go into a community fund to support local projects. In the absence of a local community energy society in the South Dartmoor area, Bath and West Community Energy agreed to raise the funds to purchase the solar farm with a view to it being taken on by a new, local community energy company after 2 years. This new company,South Dartmoor Community Energy, is currently being developed by PL:21Transition Initiative. The bond offer raised £1.68 million over a 7 week period and closed four days early!. 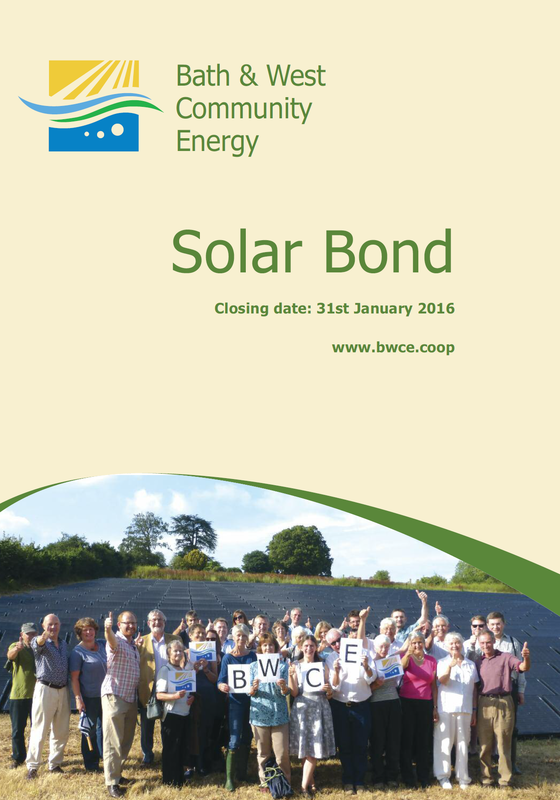 The bond offer document – http://www.bwce.coop. is available here. Peter Crone, PL:21 Renewables expert commented: “This is an exciting opportunity for people to get involved in a local renewable energy scheme. We look forward to working with communities across the area and to ensuring this solar farm becomes a successful community energy enterprise”. Investors in the Portworthy Solar Array, who subsequently invest in Tamar Energy Community’s anticipated share offer in summer 2016, may be eligible for an additional 0.5% interest (see bond offer document for more details – investment decisions should only be based on information from the offer documentation). The Ivybridge bond offer event on the 13th January is being supported by a grant that PL:21 has been awarded through the RegenSW Community Energy Accelerator Devon County Council Fund. This entry was posted in Uncategorized on December 19, 2015 by Transition Tavistock.